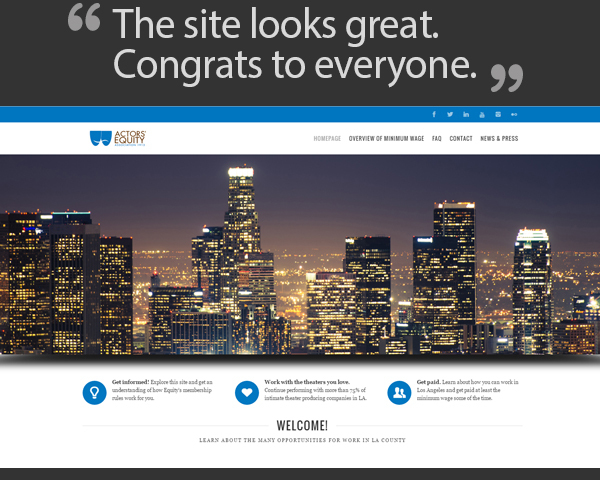 Actors’ Equity Association – Web Design | ASTRALCOM - Content Strategy, Conversion Marketing and Customer Acquisition. Actors’ Equity Association – Web Design | ASTRALCOM – Content Strategy, Conversion Marketing and Customer Acquisition. When Englander Knabe & Allen, a strategic communications firm specializing in government affairs, communications and issues management asked us to help them with a new information and education website for the Actors’ Equity Association, we jumped at the opportunity. So together, with the Actors’ Equity Association, the U.S. labor union that represents more than 50,000 Actors and Stage Managers, we created an awareness and educational website specifically as a resource for Equity members. The outcome resulted in the creation of an engaging website, deep with informative and educational content that’s easy to navigate. When it’s important to engage your audience, convey information and help create a broader understanding of your services and/or products, choose ASTRALCOM to help you create a winning solution.